The property which has the benefit of gas-fired central heating and double glazing enjoys a number of period features and well proportioned accommodation which includes : reception hall, utility/cloakroom, through lounge, dining room, fitted breakfast kitchen, master bedroom with en suite bathroom and dressing room/walk in wardrobe, 2 further bedrooms and bathroom. Garage and attractively maintained and stocked gardens with decking and pergola. Occupying a lovely position with a private driveway and parking area approx one mile sough of Shrewsbury town centre with good local amenities in the immediate vicinity and very well placed for access to all major routes. A beautifully proportioned Georgian 3 bedroomed bungalow in one of Shrewsbury's sought after residential areas. Reception Hall - With laminate flooring and decorative archways. Storage cupboard and plumbing for automatic washing machine. Dining Room - 4.93m x 4.52m (16'2" x 14'10") - With a range of fitted cupboards and deep D shaped bay window and French doors leading to rear decking. 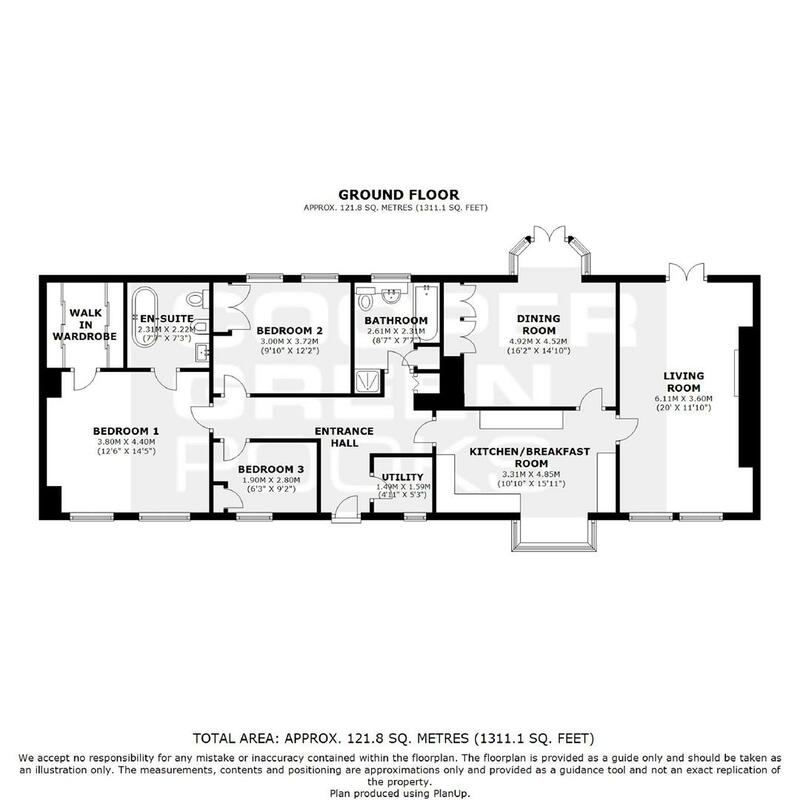 Breakfast Kitchen - 3.30m x 4.85m (10'10" x 15'11") - Fitted with a range of cream finished units with integrated appliances, ceramic sink unit and a lovely bay window overlooking the garden. Master Bedroom Suite - 3.66m;1.83m x 4.39m (12;6" x 14'5") - With 2 sash windows, concealed radiators and decorative mouldings. Dressing Room - With fitted wardrobes to either side. Bedroom 2 - 3.00m x 3.71m (9'10" x 12'2") - With built in wardrobe and dressing table. Bedroom 3 - 1.91m x 2.79m (6'3" x 9'2") - Currently used as study. TO THE FRONT the property is approached over a gravelled forecourt and parking area surrounded by well stocked shrub borders and leading to the ATTACHED GARAGE. A feature archway with wrought iron gates gives access to the front of the property with paved patio and path, lawn and well stocked shrub borders. REAR GARDEN which is enclosed by walling and fencing and laid to shaped lawn, terracotta paving, raised decked area and a summerhouse and pergola.